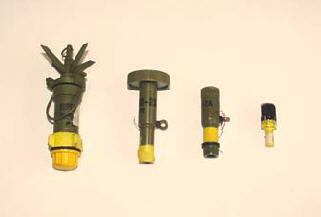 Prevalently, the only metal content in antipersonnel landmines are some parts of trigger mechanism. We radiographed these parts for types of blasting antipersonnel landmines, which are buried in the Southeastern Europe, and used them for possible landmines characterisation in the appropriate data base thereby formed. The data base serves as a basis for future investigation and characterisation of range of conditions in which landmines were found. Efficient humanitarian demining is technically demandable problem . Significant contribution to this is brought about through landmines detection process. Generally, this is a high risk and large duration process. The discrepancy between required and possible rates of humanitarian demining, in regions where war activities ceased, motivated efforts of scientific community to work toward development of more efficient humanitarian demining, in particular toward realisation of improved landmines detection technique . Despite efforts, such a technique still does not exist . Partially, inefficiency of present detection techniques is caused by complex character of landmine-soil systems, which are to be treated simultaneously. On average, these systems have been left untouched typically for several years, because of what their present states represent a variety of different configurations. Efficient detection technique should optimise between sensitivity and robustness. Sensitivity is required in order to exploit slight differences between landmines and their particular environment, while robustness is required in order to have rather small number of widely applicable types of detection equipment. Typically, R&D toward detection technique improvement includes several mutually interacting phases, e.g. testing of prototype equipment in controlled conditions, in which usually landmines are simulated with other samples . Underlying principles of these phases are (i) maximisation of the resolution of the equipment, so that landmines and other buried objects are more distinct structures, and (ii) maximisation of the demining process automation, thereby lessening the accompanied risk for the deminers. One of the consequences of automation is that landmine-soil system is transformed into particular type of signals which have to be analysed, regularly using advance signal processing algorithms. For both principles it is useful to have knowledge about realistic landmines, their structure and composition , what is more important for landmine triggers. Triggers are the rather non-homogeneous parts of landmines, hence rather complicated for characterisation. However, because of their seemingly artificial shape and existing metal parts triggers are parts that usually represent part of a mine which is actually detected, and extracted from noisy environment in.analysed signals. For example, if metal detectors are used than low metal content mines are detected only on the basis of metal blasting cup, metal trigger pin or its metal spring. Owing to variety of producers, produced types and different series of landmines, it is not known in advance whether landmines in a given area resemble completely dimensions and composition of other landmines, or there exist some differences. Additionally, there is a possibility of different types of damages in trigger components, the probability of which may be inferred on the basis of existing radiograms. Beside contribution to R&D process, radiograms of triggers are useful in education of pyrotechnicians and other personnel of a humanitarian demining process . Somewhat similar problem exist in the context of unexploded ordnance disposal. A typical situation is to have grenade with steel casing, in which there may be a chemical agent. The procedures for its disposal differ significantly in case when there is a chemical agent, compared to a case when there is no such agent. In order to formulate a data base of trigger characteristics which is to be used in testing processing algorithms, work was started toward formulation of data bases of landmine triggers, and development capabilities to represent triggers in a form appropriate in testing of a particular technique. In this paper the phase of database forming, in which radiograms of triggers are obtained and evaluated, is described. The paper is organised as follows: in the second section characterisation of triggers is presented from various points of view, yet radiography excluded. In the third section the set-up of equipment and other relevant parameters for radiography of triggers is described. Radiograms obtained are discussed in the fourth section. Summary of important conclusions is given in the fifth section. Landmine triggers are water resistant, non-magnetic parts which transform mechanical stimulus, through blasting composition, into high-pressure and high-temperature particle flow capable of activating high explosives like TNT or RDX which are put in landmines. Duration of that process is of the order of 10 milliseconds. Several types of triggers are shown in figure 1. Composition of these triggers is given in table 1. Triggers UPROM 1, UPMR 2A S and UPM 2A are made for antipersonnel metal mines. In particular, UPROM 1 is made for jumping mine PROM 1, while other two triggers are for mine PMR 2A. Trigger UPMAH 3 is made for low metal content mine PMA 3. UPROM 1, UPM 2A S, UPM 2A, UPMAH 3. Table 1: Some characteristics of triggers shown on figure 1. *these are cabs for main explosive activation. There is also detonation train for activation of explosive for jumping. Radiograms of triggers were obtained following standards [7, 8], using Balteau 200/5 X-ray apparatus. Parameters set constant in all cases shown here were: focal distance of 700 mm, exposition of 1 min, and current of 4 mA. Voltage range taken was from 80 kV to 120 kV. Pictures shown are digitalised versions of radiograms recorded on AGFA Structurix D-5 films. According to CEN the film class is C3. 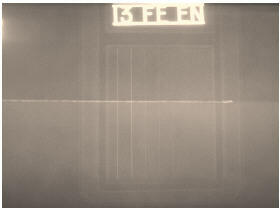 Chemical treatment of films included 7 min of developing time at 20°C, with developer G 128. Fixer was G 328, used during 15 min. Washing time was 30 min. Owing to almost axisymmetric shape, and relatively small dimensions, a trigger can be sufficiently covered using a single radiogram. Examples of radiograms are given in the figures 3 - 5. They are obtained in two steps; initial radiogram digitalisation followed with obtained grey scale picture grey level inversion. Because of that, darker regions on pictures of radiograms refer to materials with larger X-ray absorption coefficients. In order to confirm that the resolution of a sample in the process described is to a sufficient degree a constant, the radiogram of etalon wires is shown in figure 6. Fig 3: Trigger UPM 2A. Voltage during exposition was 80 kV. Fig 4: Trigger UPROM 1. Voltage during exposition was 120 kV. Fig 5: Trigger UPM 2A S. Voltages during expositions were 90 kV and 100 kV for left and right radiogram, respectivelly. In radiogram of figure 3, large difference between representations of trigger parts point to essentially different materials, e.g. steel parts in polymer casing. Such a difference does not exist on radiogram of figure 4, because there all the parts are metal. Radiograms of figure 5 show how changes in some parameters, in this case voltage, infer resolution obtained. From radiogram obtained with 100 kV, it is seen how the initial cab is connected through metal needle with a trigger head, which is made of relatively thick polymer layer. Absorption coefficients for materials similar to those used in triggers are given in Table 2. Table 2: Relevant absorption coefficients . Fig 6: Picture of radiogram of etalon wires, obtained after the same transformations as were applied to radiograms of triggers. Profiled humanitarian demining includes data base of different mine components. Here the data base of triggers is proposed. It is obtainable using radiography in a particular range of parameters. Results of radiograms obtained should be considered as one part of more complex data bases. Such a data base enables researchers, experts and producers to have a detailed scan of existing trigger, and in broader sense also of landmine, varieties; make reliable trigger simulants; or extract some piece of information about its structure. The particular realisation exploited here was a laboratory one. However, presence of portable X-ray devices makes possible closer-to-field inspection of triggers. The approach considered is not appropriate for mine detection as it operates in transmission mode, whereas the reflection mode is needed for applications in mine detection. This work is financed through the project CRO MoST 120098.